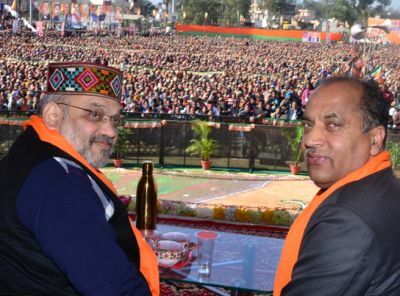 Una: Gearing up for the forthcoming parliamentary election, BJP national president Amit Shah today addressed Panna Pramukh Sammelan of Hamirpur Parliamentary Constituency at Una. BJP president stated that the Nation need a ‘Mazboot Sarkar’ instead of a ‘Mazboor Sarkar’ so that the Nation forges ahead on the path of progress and prosperity. National BJP President said that the previous State Government was a party led by a particular family and was busy in settling it own cases. He said that the Congress party at the national level was also a party of a particular family with no mass base. He said that the family ruled the nation for about 55 years and still did nothing for the country. Amit Shah said that about 33 crore new bank accounts were opened under the Jan Dhan Yojna launched by the Union Government. He said that Ayushman Yojna has ensured that even the poorest of the poor was not deprived of best treatment facilities. 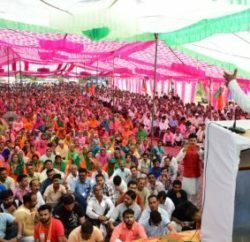 While appreciating the commendable initiatives taken by the State Government for welfare of the common man, National BJP President said that Gharini Subvidha Yojna of the State Government have ensured that the women folk of the State get rid of the cumbersome work of fuel wood collection and smoke. 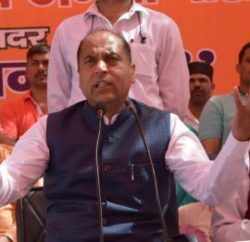 Chief Minister Jai Ram Thakur said that Panna Pramukh samelan was aimed at strengthening the party at grassroots level. He said that every Panna Pramukh must ensure personal contact with all the thirty voters in his or her ‘Panna’. He said that it was the organisation which helps in forming the Government, thus the Government was giving due respect and regard to each and party functionary. 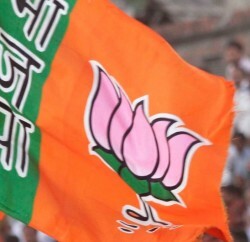 Former Chief Minister and MP Kangra Shanta Kumar credited party workers for making BJP a biggest political party of the world with over 12 crore members. He said that each party worker should ensure that the BJP wins all the four seats in the State. Former Chief Minister Prof. Prem Kumar Dhumal a candidate in the parliamentary election. Member of Parliament Hamirpur Anurag Thakur while welcoming National BJP President, Chief Minister and other top leadership on the occasion said that the present tenure of the Union Government led by Prime Minister Narendra Modi has ensured that the country emerges as the front runner in every sphere of development.